A ceremony was held in Germany to commemorate Israeli athletes and coaches who were brutally murdered at 1972 Munich Olympics Games. 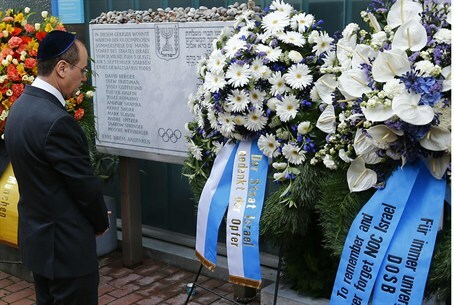 A ceremony was held in Germany on Wednesday to commemorate the 11 Israeli athletes and coaches who were brutally murdered by ‘Palestinian’ terrorists during the 1972 Munich Olympics Games. About 600 guests attended the ceremony at the Fuerstenfeldbruck air base, west of Munich, where Black September terrorists carried out the attack against the Israeli sportsmen. Israeli, German and Bavarian flags were lowered to half-staff at the beginning of the ceremony, as relatives and officials paid solemn tribute to the slain athletes. “Just recently in Burgas, Bulgaria, a terrorist murdered Israelis and proved the brutality of terror,” he said. “Iran denies the Holocaust and delegitimizes Israel. Iran is not just an Israeli problem…terror can hit anywhere and anyone," he said. "The historic occasion we are marking today states clearly that Germans and Israelis do not forget the past," Shalom added. "It was a brutal massacre…there are still many questions regarding the events of 40 years ago. After the Olympic committee refused to hold a moment of silence at the games (London Olympics) I wish to thank the Germans who asked the committee to commemorate the victims," the vice premier concluded. Ankie Spitzer, widow of fencing coach Andre Spitzer, said the trip to Germany brought back painful memories of the authorities' "disastrous rescue attempt". "For us, families of the victims and those of the Israeli delegation who were fortunate enough (to survive) Munich, Germany will be linked forever to this saddest day in our lives," she said. She condemned "the incompetence, the stupidity and the arrogance" of the German security officials "who should have saved the athletes" and demanded "a new investigation on the failures of the authorities in 1972". "It's not our profession, it's not a hobby, it's not an obsession," she said. "It's just our right to know what happened." After returning from Munich at the time of the attack, former Mossad chief Zvi Zamir said that the police "didn't make even a minimal effort to save human lives." According to the German magazine Der Spiegel, the government and Olympic organizers tried to cover up the many grave mistakes that were made at the time. Months before the attack, the interior ministry and the Bavarian state police warned federal of the possibility of "terrorist acts" at the Games, the magazine reported. All warnings were made in vain, however, as no precautions were taken in order to ensure the safety of the Israeli athletes. Ankie Spitzer initiated a campaign, urging the International Olympic Committee to commemorate the Israeli athletes at the opening ceremony of this year’s Olympic Games in London. Even after 40 years, however, he IOC, with President Jacques Rogge at its head, refused to designate one minute to pay tribute to the slain Israeli athletes.